Thyroid disease has hit epidemic levels in the United States over the last decade. Although we have medications for when thyroid disease cannot be regulated, these medications are often utilized without investigation into the cause of the disease. These medications do not serve the same functions as the hormones they are replacing and have significant side effects. Once the medications have been started, they are often required for life. Continued use of medications to treat the symptoms and ignoring the cause of thyroid dysfunction can cause complete failure of the organ over time and can have devastating effects on the adrenal glands, hypothalamus, anterior pituitary gland, sleep, energy, weight, male/female hormone production, and immunity. It would make sense to search for and attempt to correct the cause of disease prior to the use of medications for a lifetime. To efficiently treat the thyroid naturally, we must first understand all of the components contributing to thyroid dysfunction. Because thyroid hormone increases metabolism in most cells of the body, an increase in thyroid hormone can increase BMR (basic metabolic rate) to 60-100% above normal. This can result in issues such as hypertension, heart arrhythmias, and anxiety. The body traps iodine in the blood and binds it with the amino acid Tyrosine. This leads to formation of the thyroid hormones T3 and T4 which are stored in the thyroid. The hypothalamus reacts to the amount of thyroid hormone in the blood stream and sends a message to the anterior pituitary when thyroid hormone production is required. 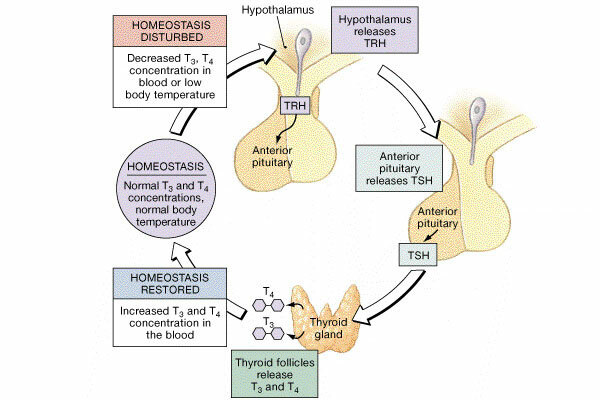 The anterior pituitary gland secretes TSH, which stimulates the thyroid to release T3 and T4 into the blood stream. Utilizing copper, selenium, iodine, and glutathione, conversion to an active form of these hormones occurs in the liver and kidneys (see picture above). In summary, many factors are required for appropriate thyroid hormone production. Exposure to harmful elements such as fluoride, chloride, and bromide can cause inhibition of iodine transport, alter thyroid antibody function, and inhibit the conversion of T4 to the most active thyroid hormone, T3. Pyridines from pollution, coal, and cigarette smoke alter T4 to T3 conversion as well as T4 binding. Decreased amounts of quality iodine are a severe problem in the United States and are a major factor in thyroid disease and breast cancer. The average American diet has 1000x less iodine than that of Japan, which also happens to be the country with the lowest recorded incidence of breast cancer. PCB and PBB (which are chemicals found in plastic packaging) can inhibit normal thyroid hormone function. Autoimmune disease is on the rise in the United States and can result in the immune system targeting and destroying normal, healthy thyroid tissue. Metal toxicity from lead, aluminum, and mercury can trigger autoimmune disorders of the thyroid and alter T3/T4 production. Impaired liver and kidney function due to poor diets and toxicity can alter T4 to T3 conversion. Impaired GI function can alter glutathione levels, impairing T4 conversion. Poor protein sources can lead to amino acid deficiencies and result in decreased amounts of available tyrosine for thyroid hormone production. Pharmacological agents (antidepressants, dopamine, lithium, glucocorticoids, and Tegretol) cause an increase in TSH and a decrease in T4/T3. High stress, low activity levels, and poor diet can alter the adrenal glands which can in turn affect neurotransmitter levels and ultimately impair normal hypothalamus and pituitary function. These and many other factors contribute to escalating thyroid disease in the United States. Optimal health depends on normal thyroid function. The underlying cause of thyroid disease must be discovered and treated. There are times when thyroid problems cannot be resolved naturally, and we are fortunate to have medications in these cases; however, the majority of thyroid problems can be resolved through natural means. The medical approach is almost always to artificially replace the thyroid hormone. The medications cannot completely replace all of the functions of normal thyroid hormones and, as a result, many of the body's systems are permanently impaired. Continued use of thyroid medications will cause continued failure of the thyroid until it completely shuts down. This is evident as patients continually require greater amounts of synthetic thyroid over the years. The natural approach to treating thyroid disease requires identification of the cause of the thyroid failure. Once this is identified, the goal of care is to reduce strain on the thyroid, stimulate repair of the thyroid, and ultimately restore normal thyroid function. Hashimoto's and Grave’s disease must be identified and/or ruled out as a cause of thyroid disease. If an autoimmune disease is present, the treatment must focus on the elimination of the trigger events for this condition. This is often overlooked in early thyroid dysfunction. There are many factors that trigger autoimmune conditions; however, the most common triggers are foods and chemicals that a patient's immune system has become hypersensitive to. These can be common foods in the diet, additives, or products in foods such as gluten, casein, whey, and yeast. It is difficult to identify these items without testing, since the reactions can be delayed 2 to 4 days and can even change over the course of time. Our office uses advanced food sensitivity testing to identify the offending foods, additives, chemicals, or products. Once identified, customized diets are created to neutralize the autoimmune response. It is essential to measure the toxic representation in the body when evaluating and treating thyroid disease. Our office has been using Heavy Metal testing for our patients for over 20 years. Once toxic elements are identified, our office uses various natural products to help bind and eliminate these toxins naturally and effectively. It is essential when testing and treating the thyroid to have a complete understanding of where in the cycle of thyroid hormone production the system is failing. This requires tests such as T3, T3 Uptake, T4, Total T4, Reverse T3, TSH, and Free T4. Thyroid auto antibodies may also be required to diagnose autoimmune disorders. Our office utilizes extensive thyroid panels which evaluate all of these levels. Repeat blood tests are also essential to determine the progress of treatment. The adrenals, hypothalamus, and pituitary are vulnerable to many lifestyle and stress factors. Since these organs are also involved in the production of thyroid hormones, it is often necessary to evaluate their function to help determine the etiology of thyroid disease. Once weaknesses are identified, there are many natural options to restore balance to neurotransmitter levels and improve the function of these organs. Normal gastrointestinal (GI) function is essential for proper thyroid function. Our office offers extensive programs to identify and resolve GI disorders for our thyroid patients. While the extent to which environmental changes have affected our health is still not fully understood, it is evident that there are many everyday chemicals that are harmful to us. Every day, we are exposed to hundreds of toxic chemicals through sources such as pharmaceuticals, pesticides, packaged foods, household products, and environmental pollution. As we have become more exposed to chemical-laden products and to toxic chemicals in food, air, and water, we have been confronted with an accelerating rate of chronic illnesses such as cancer, heart disease, chronic fatigue syndrome, chemical sensitivity, autism spectrum disorders, ADD/AD(H)D, autoimmune disorders, Parkinson's disease, and Alzheimer's disease. The Balanced Body Center offers the GPL-TOX test to evaluate for the presence of 172 different toxic chemicals including organophosphate pesticides, phthalates, benzene, xylene, vinyl chloride, pyrethroid insecticides, acrylamide, perchlorate, diphenyl phosphate, ethylene oxide, acrylonitrile, and more. This profile also includes Tiglylglycine (TG), a marker for mitochondrial disorders resulting from mutations of mitochondrial DNA. These mutations can be caused by infections, inflammation, nutritional deficiencies, and exposure to toxic chemicals. 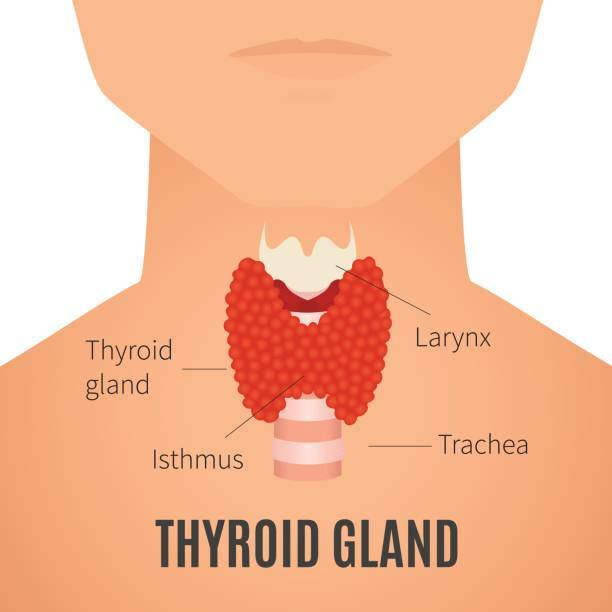 If you are interested in natural approaches to treating thyroid disease, the Balanced Body Center is one of the leading centers in chiropractic and healthcare. Our program includes a complete review of each individual's condition. The appropriate tests are recommended and evaluated, and the cause of the condition is treated naturally. For more information on natural approaches to treating thyroid disorder, check out Overcoming Thyroid Disorder by Dr. David Brownstein, M.D.